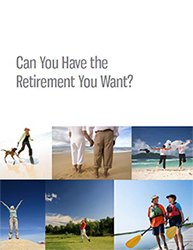 The benefits from your Retirement Lifestyle Plan don't come from doing it once and forgetting it. Planning is an ongoing process. Your plan should be reviewed and updated at least once a year, and more often if you have significant changes in your Goals. Updating your plan regularly is the best way to put current events in perspective, decide what changes are appropriate, and strengthen your confidence in the future. 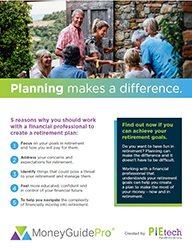 See below for the Six Steps to Creating Your Retirement Lifestyle Plan, and contact me to discuss your Financial Planning options.